For many people, a few precious hours of exercise is the single most important part of their weekly routine. We take it for granted, especially with all the options available that make staying in shape so much easier. Life Fitness has been at the forefront of getting us fit and functional for nearly 40 years. 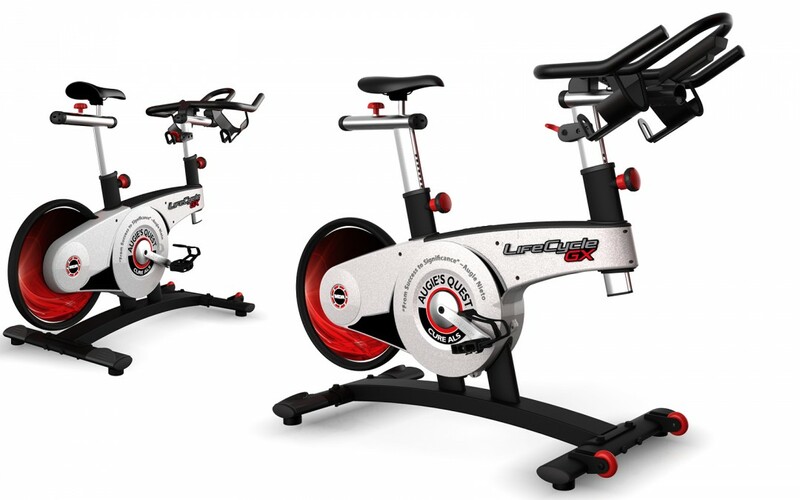 It began in the early ’70s with the the first ever electric stationary exercise bike, the LifeCycle, and continues today with one of the widest arrays of exercise equipment and a commitment to cutting-edge technology and great design. We talked with Senior Industrial Designer of the Life Fitness Industrial Design Group, Wayne Brezovar, about his background and how the group uses KeyShot for everything from color studies and rapid visualization to marketing collateral and installation guides. What inspired you to become an Industrial Designer? I always won competitions in arts and design, but never realized at a young age there was such a profession associated with creativity, form study, proportion, color, materials, engineering and manufacturing combined with aesthetic elegance. Then the profession of Industrial Design was presented to me. Working as a welder and providing graphic design to large scale signage for a local manufacturer, a friend invited me to his university for the weekend to show me what he was studying. I entered a room full of problem statement boards, concept sketches of possible solutions, foam models, and students, all passionate about their personal creations. At that moment I realized my love for design–that creating tasteful solutions was an actual career, which a collective group shared–this is what led me to pursue Industrial Design as a lifelong profession. What are some of the highlights throughout your career? As an Industrial Designer for more than 23 years, there have been many rewarding adventures throughout my career. One has been the excitement of working with outstanding creative teams within multiple groups in consulting and corporate environments, producing product from concept to realization. Earlier highlights as a young designer (prior to the 3D CAD boom) would be developing concepts without the use of 3D CAD and rendering packages. I would compose concept sketches (without a tablet), marker renderings and 2D mechanical drawings along with working prototypes generated in a model shop. This was the most effective way to communicate the original design intent of a manufacture-able product to clients and engineers. This made me appreciate the true craftsmanship of product design and its challenges. Later highlights encompassed developing computer products with Compaq Computer Corp, traveling the world designing with OEM teams. Enhanced technologies using of 2D/3D CAD at this point was a powerful tool in helping designers communicate with the different disciplines of the development process (engineering, marketing, and manufacturing) and still maintaining original design intent. Observing product manufactured on a large scale, from Compaq notebook computersand Target I-Fix tools to window/door hardware still in use by Andersen Windows are additional highlights of my career. The introduction of new products at Life Fitness including FlexStrider (a free motion cross-trainer) from initial ideation sketches connecting with marketing, engineering and bio-mechanic teams, to witnessing the product come to fruition was also huge success for the highlight reel. What would you say is unique about the design process at Life Fitness? At Life Fitness we are a turnkey research, development and manufacturing organization. Aside from most product manufacturers, we deal with product that enhances health and wellness through physical application. Developing large scale products that incorporate console interfaces communicating with gyms, fitness groups and other fitness applications/products is unique in itself. We are one of the few fitness companies that employ a full biomechanics team working alongside the designers in development of fitness machinery. Part of an internal Industrial Design group, we validate and prove out concepts early and often in the process. We are unique for being tied into all levels of the design process (research and development, concept to manufacturing) using high tech applications such as sketch tablets, multiple 2D/3D CAD software, and full prototyping/manufacturing capabilities. We might not be unique by design industry standards, but our group delivers output to most internal teams and external suppliers, ranging from original artwork, high-end renderings for marketing, 2D/3D CAD data for prototyping and engineering validation, graphic applications, color, material and finish (CMF) documentation, and human factor studies. That’s cool stuff. You can see the whole product develop process on the Elevation Series here. How has KeyShot helped save time, money, or improve quality? Where do I start? As mentioned previously, our design process taps into every aspect of the development cycle and KeyShot has been an instrumental tool utilized throughout. When finalizing the initial creation of realistic, manufactured product concepts, we use SolidWorks (3D CAD) software to generate surface and solid modeling. At this point we bring that data into KeyShot and develop initial renderings for concept presentation and approval from LF teams. This is a time and money saver because at this point we don’t necessarily need to prototype multiple concepts. Creating renderings in KeyShot is also significant in evolving the CMF (color, material, and finishes) document. Applying the KeyShot material library, we can simulate the textures and finishes of different substrates kicking off early development of materials and processes with vendors. The ability to bring in graphics from Adobe software is another advantage for early graphic placement and application. This allows for rapid visualization and validation of piece part development and manufacturing costs. Finally, due to deadlines for product launches and production, we can utilize KeyShot data upfront in process for marketing collateral, website development, packaging, installation guides and video applications prior to spending money with photography, models, and prototyping. The quality of final concept presentations is outstanding and helps to effectively communication the design realization. What were some of the challenges KeyShot helped overcome, if any? The challenge KeyShot helped overcome at Life Fitness was the ability to develop concepts at a fast pace and present to executives team members at levels they could comprehend prior to kicking off a development cycle. Normally we would have to wait for the development of actual prototypes after concept sketches/renderings (still important) which is costly and time consuming. KeyShot helped the engineering teams understand materials and finishes prior to the development of early prototypes which helped them plan and cost out certain applications and manufacturing processes. We also used the software to explain part break-up and assemblies using fly-through animations. Finally, use of KeyShot helped minimize delays for our creative group in the development and release of marketing materials, imagery for sales and product promotion. What is one piece of advice would you pass along to someone interested in doing what you do? Become a doctor. Seriously though, I would say if a student realizes he/she has a passion for design and it’s the area in which they find great satisfaction, they should seek out a good mentor and pursue design with everything they have to offer. This requires realizing their talents and harnessing them through use of all the great tools they have at their disposal (such as KeyShot). Even though we are developing product within the digital world today, they shouldn’t abandon craftsmanship and the true art of developing inspiring form, appropriate proportion, and styling. Good design starts with a complete understanding of design fundamentals and basic hands-on skills before developing 3D objects digitally.